GEPR HOME >The External Effects of Electricity Generation are Little and the Cost of Nuclear Power Plants is Low – From the Measurement Index "Extern E"
The External Effects of Electricity Generation are Little and the Cost of Nuclear Power Plants is Low – From the Measurement Index "Extern E"
Last year's earthquake has stirred up a vigorous debate about the cost of generating electricity. It has already been introduced (through news stories) that the Commission for the Investigation of the Costs of the Cabinet Office's Energy and Environment Conference reevaluated the cost of generating electricity with nuclear power plants last December. But what is important here is to fairly evaluate "the inci　dental costs of electricity generation" for all sources of electricity and compare them in a table. In addition to direct costs like that of building a plant, fuel, transportation, and maintenance, the incidental costs of electricity generation need to include external costs such as the environmental burden associated with electricity generation. Since 1990, Europe in particular has promoted the creation of tools to extract the external costs and evaluate their amount for the purpose of internalizing external costs involved with electricity generation. This is a measurement index called Extern E that the EU (the European Commission) carried out after assembling experts. It is the most typical example of a tool to evaluate the external costs involved with electricity generation, and other evaluation tools basically follow its lead. In this sense, Extern E is the de facto standard for evaluating external costs involved with electricity generation. 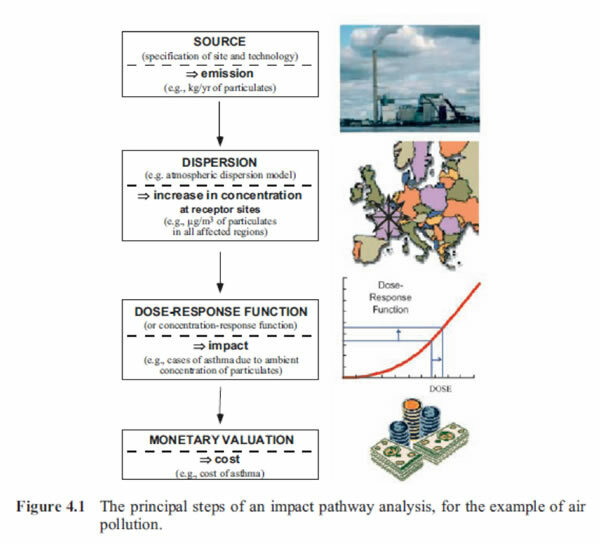 The above figure uses atmospheric pollution as an example to show the steps in evaluating externalities within Extern E. It is broken down into four general steps. The first step is evaluating the emissions of the substance in the source. The second step is simulating the emitted substance's diffusion and deposition, its movement from soil to groundwater and crops, and its bioconcentration, etc., while considering climactic and environmental conditions. Continuing, the third step is predicting all the ways it might enter a person (inhalation, absorption as food or drink, absorption through the skin, etc.) and evaluating the presence and extent of health effects in those cases. At this time, one must consider the population distribution and density in the relevant area. After all that, the fourth step is converting the various effects that accompany emission of the substance into a monetary value. The above-mentioned is an overview of externality evaluation within Extern E. You can think of other tools for evaluating externality as being nearly identical to this method. Extern E deals with a diverse array of externalities. Common examples include noise, health effects (especially from chemical substances), crops, materials, effects on the ecosystem, and effects on global warming. For example, in the case of health effects caused by a chemical substance, 15 items are listed out: SOx (sulfur oxides), NOx, carbon monoxide, hydrocarbons, hydrogen sulfide, VOC (volatile organic compounds), particulate matter, greenhouse gases (CO2, methane, etc. ), chloride, fluoride, phosphorous compounds, solid waste (e.g. coal ash), liquid waste, trace substances (e.g. heavy metals), and radioactive material. External costs are evaluated following the scheme above for each of these items. 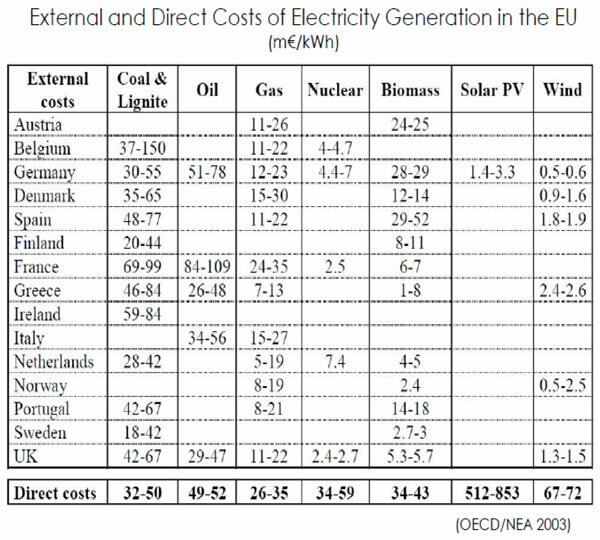 As an example, the table below shows the results of an external cost analysis of electricity generation in Germany following Extern E.
This table makes clear that the power source with overwhelmingly high external costs is coal, especially lignite. The external costs of thermal power plants that use lignite are remarkably high due to lignite's low grade. Because lignite contains large amounts of moisture and many impurities, it has a low calorific value. In addition, it releases large amounts of particulate matter and CO2. Therefore, it has a relatively large effect on health, the ecosystem, and global warming. In contrast, the external costs of nuclear power are low. The damage costs alone are about 17% that of lignite. Factoring in avoidance costs, or the effect on the ecosystem and global warming, it becomes approximately 7% that of lignite. Incidentally, as pointed out in the previous column, the effects should a serious accident occur have also been taken into account. Evaluating the external costs for each type of electricity generation is significant for many reasons, but the most important is being able to quantitatively evaluate the potential risk of each power source and line up and compare those costs before shaping and carrying out energy policy. That way, a comprehensive decision not swayed by near-sighted thinking but based on the big picture becomes a possibility. Above all, lining up and comparing the cost of electricity generation including external costs provides important information to select the optimal form of energy for each country and region. The external costs of the same fuel can vary greatly from country to country due to varying conditions such as differences in environmentally friendly facilities and the population density and flora surrounding the site. However, despite any differences in conditions, the tendencies for the external cost of each type of electricity generation are nearly the same in every country. The external costs are highest with coal/lignite and heavy oil, distantly followed by gas. Biomass comes next, with nuclear, solar, and wind the best from the viewpoint of external costs. Adding direct costs to this, nuclear power's superiority stands out even more. Furthermore, the above table uses data from 2003, making estimates of the direct costs of solar power in particular higher. Because of economies of scale with mass production, solar can now be used for power generation more cheaply. Nevertheless, the difference between nuclear and other forms of power is obvious. Last December in Japan, the Commission for the Investigation of the Costs of the Cabinet Office's Energy and Environment Conference evaluated and published the cost of generating electricity including external costs from each power source. This report's evaluation is riddled with problems. As has already been pointed out, it has a feeling of arbitrariness, as if it were intentionally trying to make the cost of generating electricity with renewable energy, especially solar energy, look lower. In contrast, there are glimpses of the costs of nuclear power being intentionally evaluated to be as high as possible. Because of this, it is dangerous to take the report's numbers at face value. Still, even with such an arbitrary evaluation, the price of generating nuclear power is 8.9 yen/kWh. No matter how many allowances are made for solar energy, it still costs over twice as much as nuclear. With the start of the Feed-In Tariff in July, its purchase price will be 42 yen/kWh. The significance of this is that the superiority of nuclear power in Japan does not budge even when external costs are included. On the other hand, thermal electricity generation, especially coal, tends to have high external costs. This is due to the emission of SOx, NOx, particulate matter, and CO2, as mentioned before. However, coal power plants in Japan, which are fitted with electric dust collectors and denitration and desulfurization equipment, are completely different from plants in the majority of other countries, which are not equipped with these. This should be considered a situation characteristic to Japan. In light of everything above, it is abundantly clear that from the point of external costs, nuclear power is the economically superior energy source, even when externalities such as damages from serious accidents are factored in. The Japanese government is talking about phasing out nuclear power as if that is already the established policy and supporting an atmosphere in which many citizens support this. However, the external cost evaluation represented by Extern E clearly shows this choice to be wrong. People must realize this error as soon as possible.